AnyWater is the unique portable solution to healthy drinking water. Its central cartridge contains a powerful filter, alkaline minerals, and magnetic media. It not only filters out chlorine, heavy metals, and bacteria. 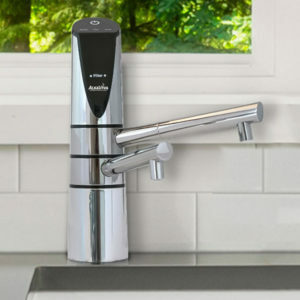 But unlike a Brita or similar filters, it ionizes and re-mineralizes ordinary tap water. Safety — Contaminants removed. The bottle contains no Bisphenol-A, no PVC. Healthy – Alkaline minerals and high pH help neutralise the build up of acid toxins in your body’s tissues. Convenient – Easy to use and portable: at work, camping, travel or sports. Includes a year’s supply of replacement filters. Great tasting water – Not only will you enjoy the taste, but you’ll naturally drink more water – as everyone knows, a boon to digestion and the prevention of chronic diseases. Replaceable filter/cartridge lasts for 90 days; We provide a year’s supply of cartridges. Contaminants removed: chlorine, heavy metals, bacteria, insecticides, and other impurities. AnyWater Portable Alkalizer comes with a year’s supply of replacement filters. Store-bought bottled water isn’t just expensive. It contributes to the over-consumption of environmentally un-friendly plastic made from non-renewable fossil fuel resources. When these bottles are emptied, they become landfill – or garbage that ends up in waterways. Greenhouse gases are the by-product of manufacturing these disposable, store-bought plastic water bottles. So too are the carbon emissions from vehicles that transport these bottles to shops. With AnyWater, you’ll be drinking fresh, alkaline, mineral water –without wasting your money or the planet’s resources in the process. Please Note: Your AnyWater is made from ABS & PET plastic and is BPA free. HANDWASH ONLY – do not put in the dishwasher.